A new program by the Comune of Venice is slapping leviathan fines on people who buy counterfeit designer goods from those guys with the open-air blanket-bottegas that seem to be at the foot of every bridge. How does a 10000 Euro fine sound for that ratskin Prada-like wallet? Believe it or not, it's possible. The program is called "Bad Bag", and posters have gone up all over town warning visitors of the new down-side to "brand crimes". It's interesting that the program name is in English. I'm guessing that we anglophones comprise the biggest chunk of the target market. Venice has long been overrun with ersatz designer goods sellers. I have to admit, I haven't been able to advance a theory on how it is these guys -- largely foreigners -- have been able to operate so freely. Venice is so incredibly finite, so full of dead ends and limited-access campi. It would seem that trapping their quarry would be a fairly low-order military operation for the carabinieri. It must be more complex than I realize. I've always wondered about the true effectiveness of hyper-criminalizing consumers who buy illegal stuff and services, when the real target is intended to be the sellers. Can anyone think of a case where sellers were, in effect starved out of business? I know it never seems to really shut down prostitution or drug operations. Well, as you said, most of the "vendors" are stranieri. I'm guessing that they are ethnic minorities. Bringing the hammer down on them would elicit cries of racism "why are you busting the predominantly darker skinned purveyors of goods who are merely satisfying the demand of the lighter skinned purchasers of these goods? Racism!" Also, if these guys are "often involved in other crimes in the city" that raises the possibility of payoffs to look the other way. Louis Vuitton apparently paid for investigations of the selling of counterfeit merchandise, as reported in Il Gazettino & La Nuova Venezia in 2000 and 2001. I gleaned this in "Venice: The Tourist Maze" by Robert C. Davis and Garry R. Marvin. They write that there appear to be 'connections between the vu'cumpra and the Italian underworld. It does seem likely that the Neapolitan mob, the camorra, has - or is trying to establish - a hand in every stage of this business, from manufacturing the purses and handbags (in secret factories in Tuscany and Campania) to supplying the vendors, assigning their territories, and (inevitably) collecting a healthy cut of their take.' This is from page 119. This might explain why despite continuous seizures by the police, the vu'cumpra are not deterred. If you want an interesting take on the vu compra' check out the latest of the Donna Leon mysteries featuring Commissario Guido Brunetti. Donna Leon, a longtime resident and teacher of English (and writer of libretti) in Venice writes beautifully about many of the agonizing dichotomies in Venice in her books. This newest, which I am only beginning to read, is titled "Blood from a Stone" and she speculates heavily on their Camorra origins and protections. Leon quotes police figures which show that most of the original Vu Compra' (or ambulatori) are not involved in other crimes or violent crimes. But as always, there's a lag time between the published word and the reality. Saw these guys several times and it was quite amusing to see then shout warnings to each other, grab the blankets by their four corners to contain their gear and run like mad! I just found you. Venice is my favorite place anywhere, which may not be fair since I haven't spent as much time anywhere else. And now I probably won't go back again. I don't travel well anymore. I have just come back from Venice, I have visited several times over the last 40 years. I have never noticed so many immigrant bag sellers. 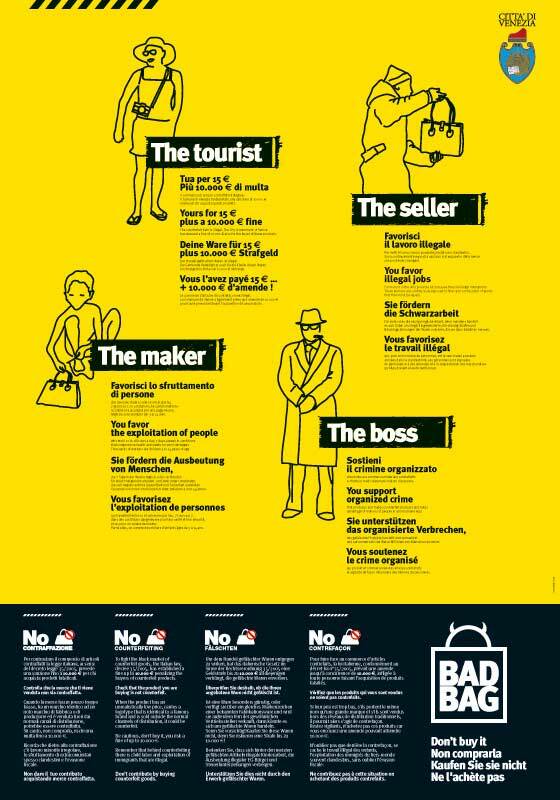 It seems a bit harsh to me that the buyers are fined when it is clear that the police know perfectly well the regular pitches for these bag sellers and prefer to stand around St Marc's square smoking a cigerette and posing for the tourists. As you say it shouldn't be too hard to black the bridges, grab to vendors and put them on a boat our of venice. Whiolst we were there about a dozen of these vendors made a run for it, knocking over a little girl in the process, slowing chased by a reluctant policeman. I think it is just another way to rip off the tourists, and I don't mean the vendors. One of the biggest crime in Venice is tax evasion and prices which change according to your face or your social status. it is good that people learn about issues like this, since a few days since our society has had a big turn, so it is necessary to learn techniques such life, thanks for sharing the post! Lee, thanks for the info! Fascinating. If your friend has access I'd (obviously) love to see inside. Never was proud. Because a proud, you will be in should agree to the occasion stubborn; Because a proud, you will refuse the advice and friendship help, Because a proud, you will lose objective standard. hello, i think that this post is very good because has good information, thanks for sharing.